A simple mod that patches the various typos and grammar errors in Muppetpuppet's remarkable Quests and Adventures mod "Moonpath to Elsweyr". Muppetpuppet for the original mod "Moonpath to Elsweyr"
Removed Siligonder Chitin Armor description - normal unenchanted items in Skyrim have no description. Changed the actual effect of eating Rivercrab meat to match the description. Changed "Siligonder Chitin Arrmor" to "Siligonder Chitin Armor"
Changed the paralysis time of "Poisonbite Venom" from 23 to 3. The original value was so outrageously overpowered I assumed it could only be a mistake. Full release of the mod. As far as I'm aware, I've fixed all the errors in the mod, but please contact me if you find one I missed! Capitalized multiple instances of "moonpath"
Changed multiple instances of "Justicar" to "Justiciar"
Fixed "By the Light of the Moon" and "The Sweet Taste of Elsweyr"
Muppetpuppet's "Moonpath to Elsweyr" is stunning. The environments are rich and detailed, the quests are challenging and the enemies are enormous fun to slay. What always bothered me, however, was how in places the spelling and grammar really let the mod down. This simple patch aims to fix the plethora of errors the original author failed to spot (though since English isn't his first language, you can hardly blame him). As far as I'm aware, I've fixed all the errors in the original mod, but feel free to comment with any other typos you come across, I'd be more than happy to fix them. Please note that I haven't had the facilities to test this beyond my own laptop, but as I've only edited the text files and the mod has been cleaned using TES5Edit, there shouldn't be any cause for bugs. All the same, please save the game before you install this patch so you can go back to it should anything go wrong. I recommend installing, updating and uninstalling using NMM. If you're one of those bizarre people who likes to use mods without a mod manager, just drop the .esp into the skyrim/data folder. In terms of load order, this should be placed immediately after "moonpath_questdata.esp". 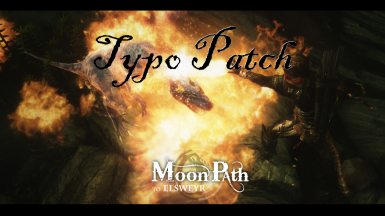 This patch requires the latest Nexus version (9.5) of Muppetpuppet's "Moonpath to Elsweyr", available here. Muppetpuppet is the author of Moonpath to Elsweyr and presides over its files. However, he has given me permission to produce this mod, so while he isn't involved in it and isn't responsible for any faults, he is aware of it.